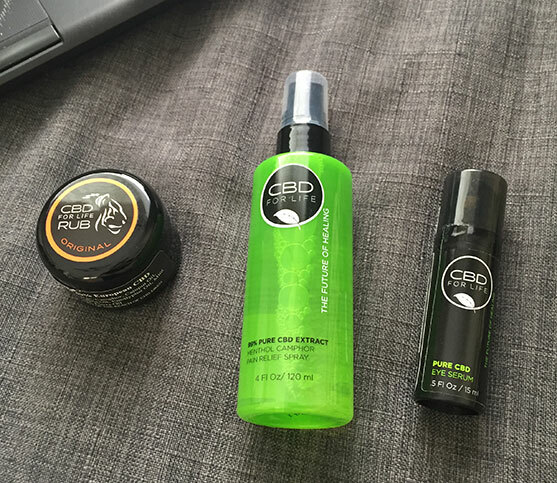 CBD For Life Skin Care Brand Review - First Official Hemp Beauty Co. If you’re looking for a hemp-based skin care company, then we might have found the perfect one for you. CBD For Life is a company owned by women, raised by women, but provides products for both men and women. The CBD industry is a little shaken up by this company (for good reasons) as it is a company that is devoted to strictly beauty and anti-aging properties. Men, keep reading (this isn’t a makeup line), it is all about proper skin care and using the amazing benefits that CBD offers to reverse signs of early aging and treat damaged skin- not just on the face. They also strive to incorporate pain management into their products. So, win/win situation. This review is unbiased and is all based on facts, information, customer reviews, and everything else that we’ve gathered. In addition to this, we strive to review companies in an honest light and provide all the information you need to be summed up in a short review so you know exactly what you’re looking for. This company was founded by women and is run by women, manufactured out of New Jersey. The CEO, Beth, had a life-changing experience when she used a mixture of CBD and essential oils to create a rub to relieve her back pain caused by spinal scoliosis. Her mixture caused a serious reduction in pain and discomfort, and ideas blossomed after doing extensive research on CBD and its potential healing abilities as well as total skin rejuvenation. In February 2015, the company was launched, and they quickly saw their business skyrocket; there weren’t many other CBD businesses that focused solely on skincare. What makes their journey even more interesting is that they have solid 5 star reviews. I’m serious, a solid 5 stars. Many companies will have one or two bad reviews that lead to a 4.8 or 4.9, but not CBD For Life. Since their launch, they have been featured in dozens of magazines, including the famous Cosmopolitan and Marie Claire. To add to their success, all of their products retail for under $35, so it is an extremely affordable new way of battling skin issues. CBD For Life honestly doesn’t have too many competitors. Return Policy: 30-day 100% customer satisfaction guarantee, can return for full refund. Where To Order: Online and in authorized retailers. No coupons found at this time. However, CBD For Life products are already very affordable and low cost, so let’s not get stingy. Also, they have bundled up a huge product assortment in their Bundle and Save section, providing multiple products in one package saving you anywhere from 10-20% total. This company is absolutely flooded with reviews on many different products, so it’s hard to choose which ones should be reviewed. Each product is created for a certain issue, and it delivers every single time. Not only do they have a long lasting product line, but they regularly launch new products that become a hot topic. Pure CBD For Life Rub (in lemongrass and lavender) – The natural CBD rub is one of the first thought of products, so it’s only necessary we review it first. When Beth, the company’s CEO, looked for a treatment for her scoliosis, this is what was similarly formulated. So, the rub is basically the MVP of the company- it’s what started it all. CBD For Life toots this product as being the answer for aches and pains, while it simultaneously melts away melts away the tension that is due to sore muscles. It can be applied to any area that you are experiencing pain and inflammation in, or rubbed on to your temples or back of the neck for tension and migraines. The rub is .9 oz with 99% pure CBD extract and is only a mere $25. So, we are left wondering how much true CBD we are getting. It only mentions on the bottle that it contains 99% pure CBD extract. Other than that, the product does seem pretty flawless and has many reviews from people stating that it has reduced severe chronic pain and has relieved some terrible anxiety symptoms. The oral spray is only $25 and contains 0.30 Fl oz, so we are sure that it is worth it and lasts a very long time. Pure CBD Lip Balm – With hundreds of thousands of lip balms on the market, CBD For Life is putting their carbon footprint in the industry. Why? Because at only $9, this is a miracle in a tube according to users. Traditional store-bought lip balm can be anywhere from $1-$5, and lip balm/serum from luxury makeup brands can be anywhere from $7-$40 and more, and there are endless lists of chemicals and compounds that you didn’t know existed. With that being said, CBD For Life is promoting their CBD infused lip balm to people with severely dry lips, boost elasticity, and are safe for people with sensitive skin. Not only that, but the lip balm only has 7 ingredients that are all 95% naturally derived. One customer noted that this product was life-changing after suffering from extremely dry and cracked lips for years and going through different lip healing products with no positive results. She also mentioned that she started seeing results after only one day and one application. Wow! It is truly great that there is a CBD company out there focusing solely on beauty and skin care because it truly is a rarity. With dozens of people boasting their product, it’s difficult to have any complaints about this company, other than the fact that they don’t claim to have 100% natural and organic products as well as a third party lab test proving CBD content. Other than that, it is nothing short of 5 stars. Many companies are just now catching on to the healing properties of CBD in terms of anti-aging and total skin enhancement, but the women of CBD For Life discovered this early in the game and they are the top dog. Have you purchased the CBD Forr Life products? Please share your ratings with us on the brand and leave a comment.